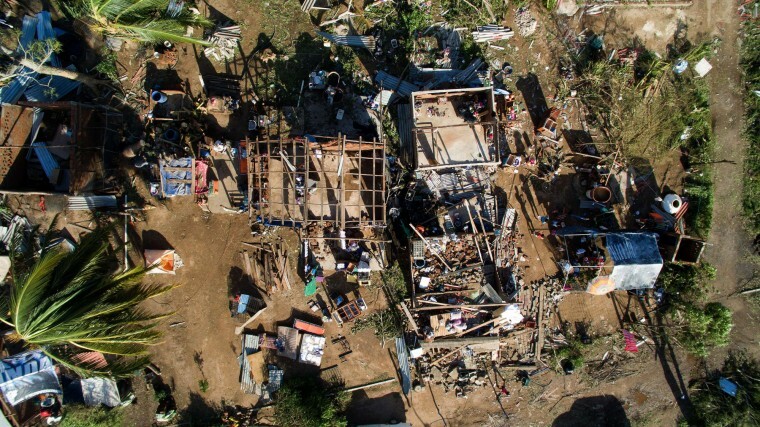 Record-breaking Hurricane Patricia appeared to leave remarkably little damage as it moved rapidly inland over mountainous western Mexico early Saturday and weakened to tropical storm, though authorities warned it could still cause deadly floods and mudslides. 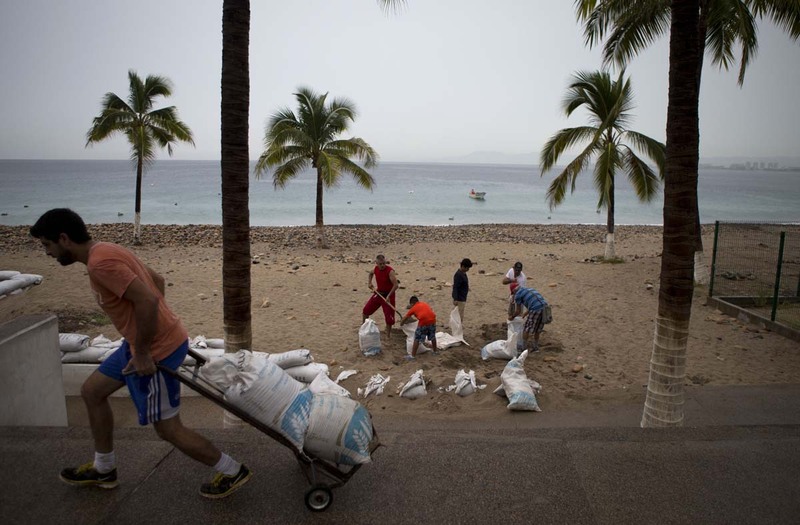 People unload sandbags to use as protection of their businesses in preparation Hurricane Patricia in the Pacific resort city Puerto Vallarta, Mexico, Friday, Oct. 23, 2015. Patricia barreled toward southwestern Mexico Friday as a monster Category 5 storm, the strongest ever in the Western Hemisphere. 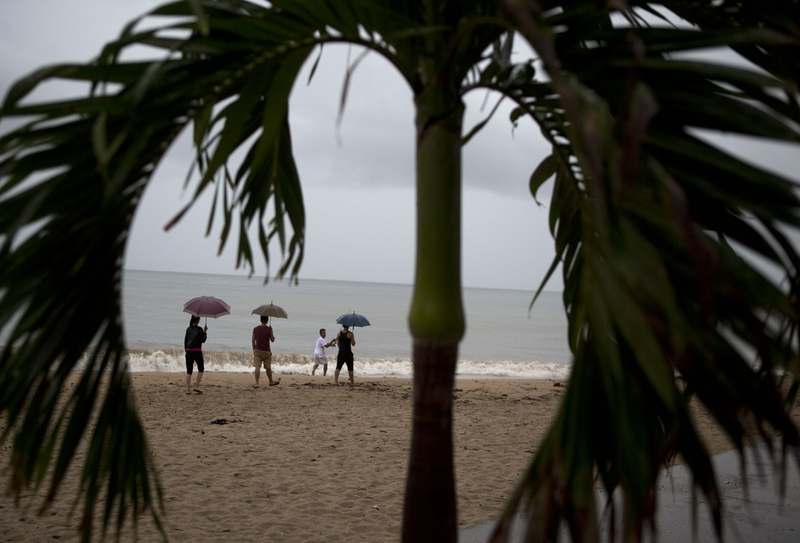 Locals and tourists were either hunkering down or trying to make last-minute escapes ahead of what forecasters called a “potentially catastrophic landfall” later in the day. 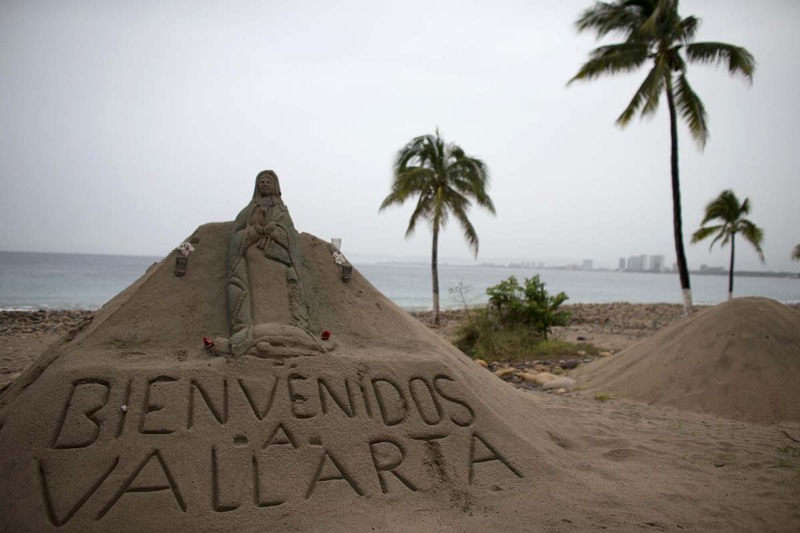 A sand sculpture carved with a message that reads in Spanish; “Welcome to Vallarta” decorates the beach in Puerto Vallarta, Mexico, Friday, Oct. 23, 2015. 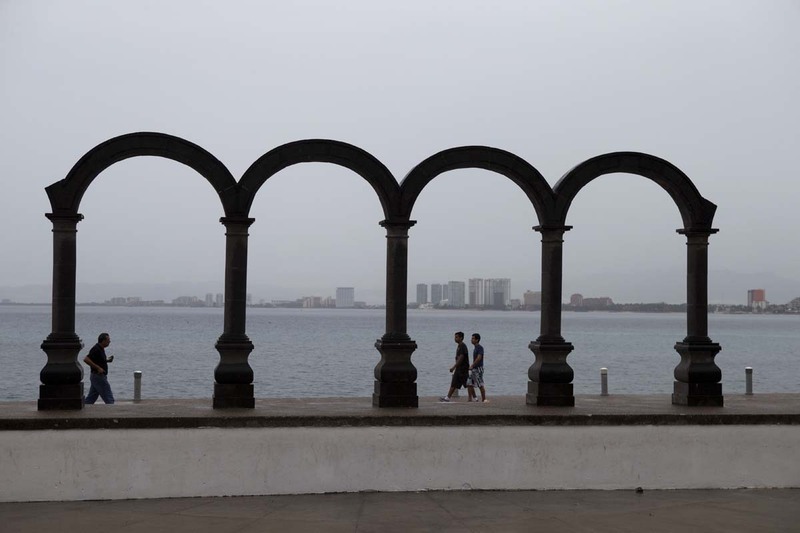 Patricia barreled toward southwestern Mexico Friday as a monster Category 5 storm, the strongest ever in the Western Hemisphere. Locals and tourists were either hunkering down or trying to make last-minute escapes ahead of what forecasters called a “potentially catastrophic landfall” later in the day. 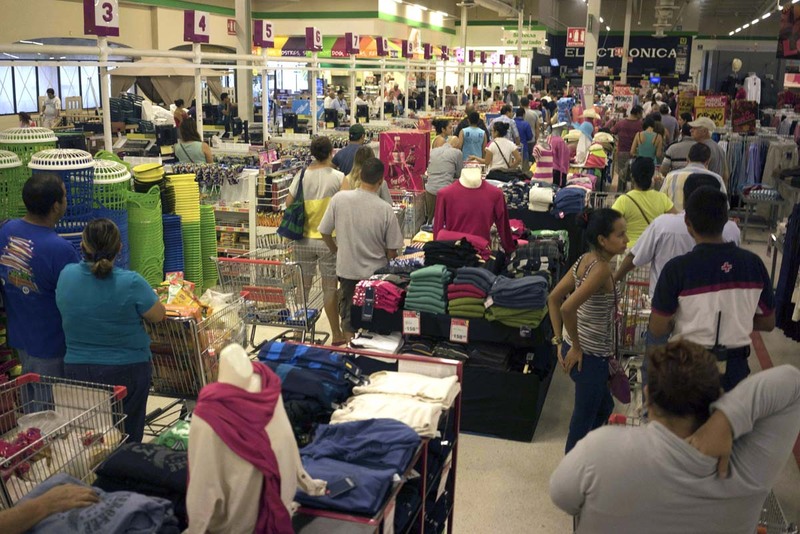 Shoppers stand in line to buy supplies at a supermarket in the Pacific resort city Puerto Vallarta, Mexico, Friday, Oct. 23, 2015. 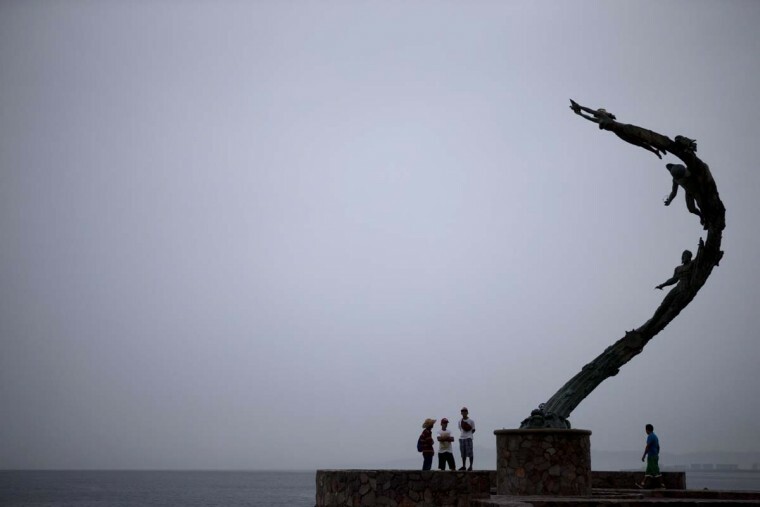 Hurricane Patricia barreled toward southwestern Mexico Friday as a monster Category 5 storm, the strongest ever in the Western Hemisphere. 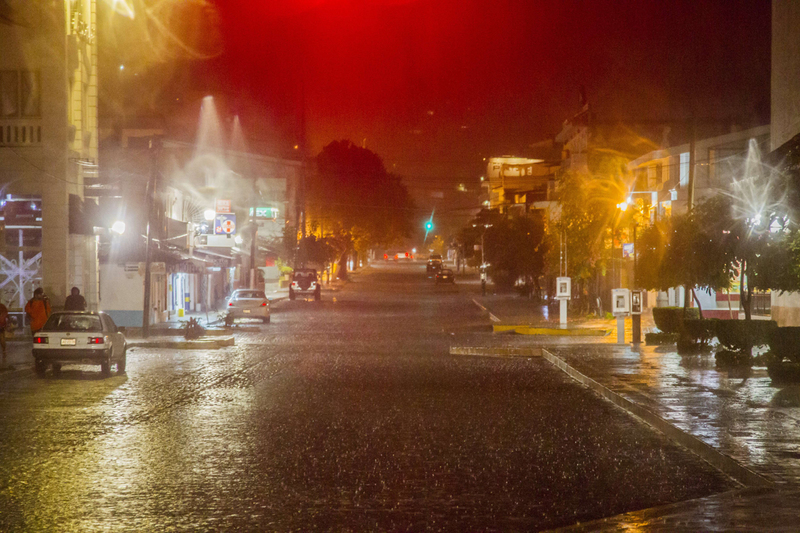 Locals and tourists were either hunkering down or trying to make last-minute escapes ahead of what forecasters called a “potentially catastrophic landfall” later in the day. 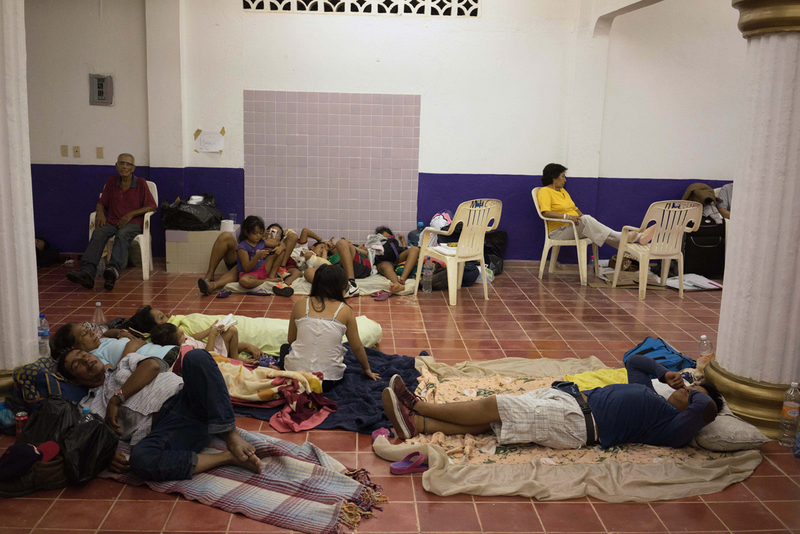 Mexican and international tourists wait at a conference center to be transferred to a shelter, ahead of the arrival of Category 5 Hurricane Patricia in Puerto Vallarta, Mexico, Friday, Oct. 23, 2015. 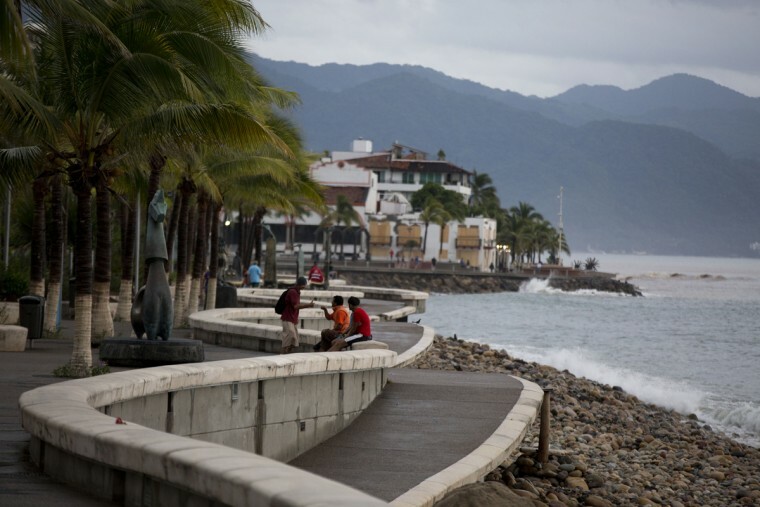 Teams of police and civil protection are walking along Puerto Vallarta’s waterfront Friday morning advising people to evacuate. 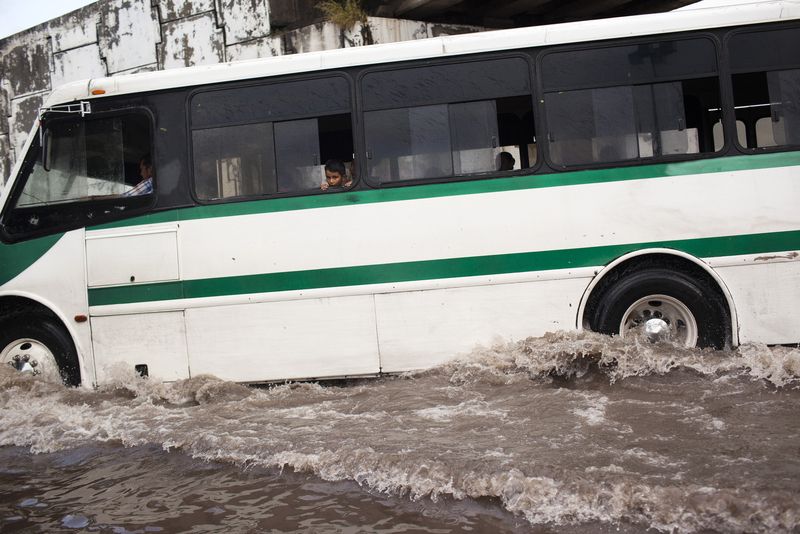 A top civil protection official says that three airports in the path of Patricia in southwestern Mexico have been shut down as the storm approaches. 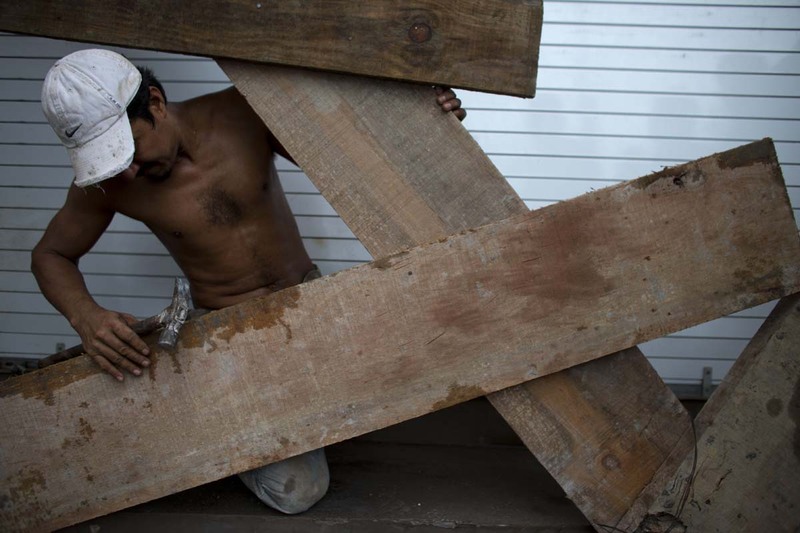 A worker boards up the front of a waterfront business, as residents prepare for the arrival of Hurricane Patricia in Puerto Vallarta, Mexico, Friday, Oct. 23, 2015. 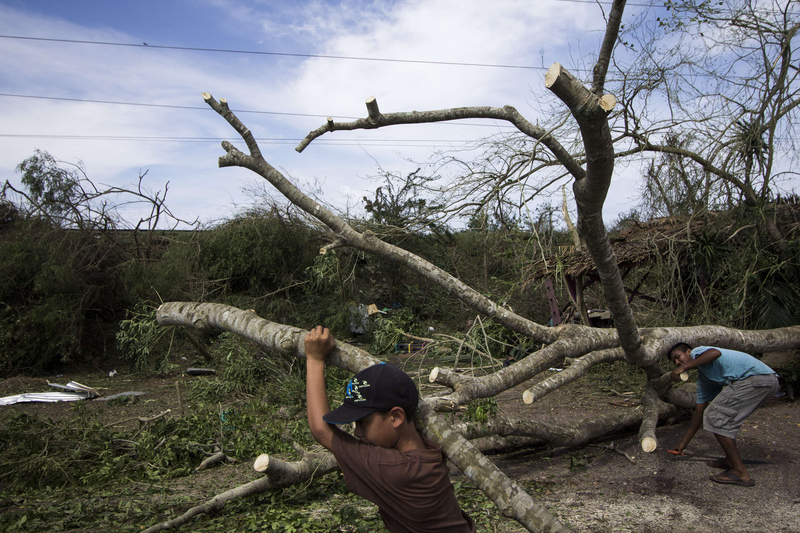 Patricia barreled toward southwestern Mexico Friday as a monster Category 5 storm, the strongest ever in the Western Hemisphere. Locals and tourists were either hunkering down or trying to make last-minute escapes ahead of what forecasters called a “potentially catastrophic landfall” later in the day. 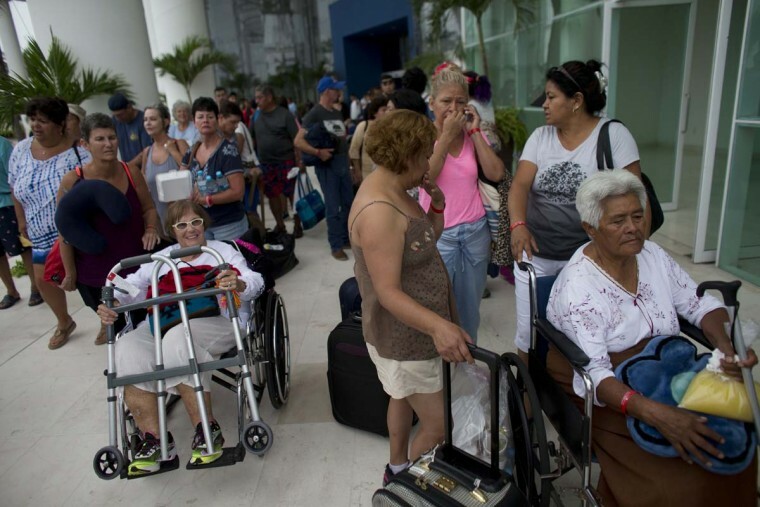 American tourists wait outside a conference center to be transferred to a shelter, bracing for the arrival of Hurricane Patricia in Puerto Vallarta, Mexico, Friday, Oct. 23, 2015. Teams of police and civil protection are walking along Puerto Vallarta’s waterfront, advising people to evacuate. 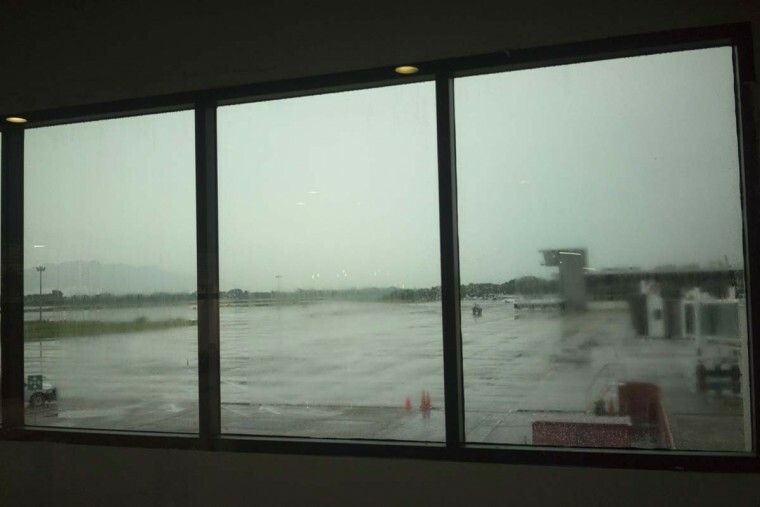 A top civil protection official says that three airports in the path of Patricia in southwestern Mexico have been shut down as the storm approaches. 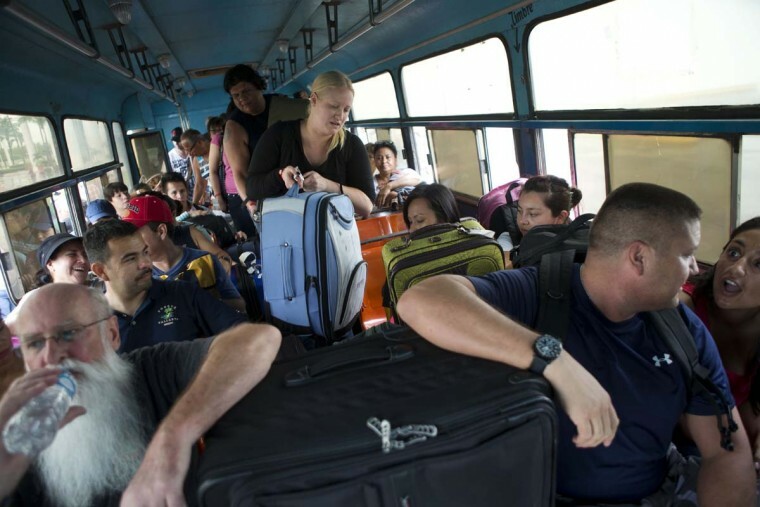 Mexican and international tourists board a bus at a conference center to be transferred to a shelter, bracing for the arrival of Hurricane Patricia in Puerto Vallarta, Mexico, Friday, Oct. 23, 2015. 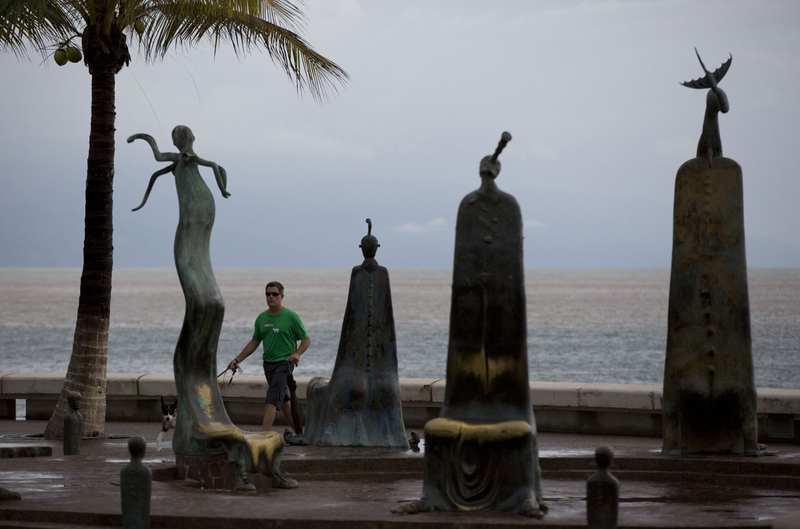 Teams of police and civil protection are walking along Puerto Vallarta’s waterfront, advising people to evacuate. 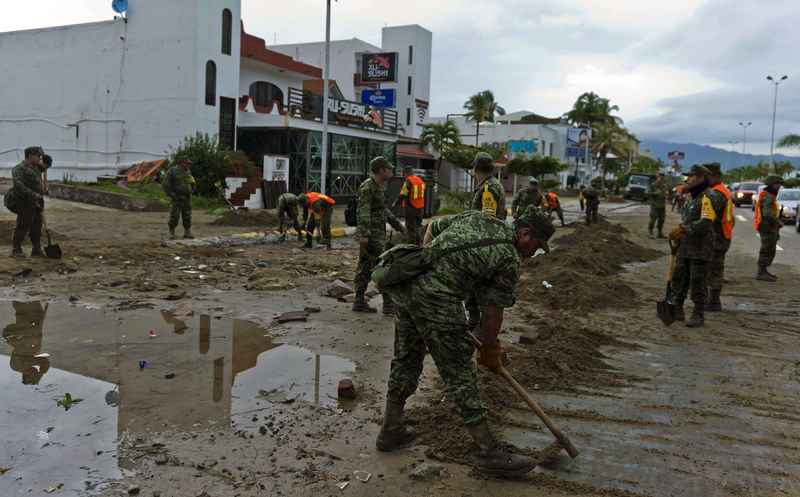 A top civil protection official says that three airports in the path of Patricia in southwestern Mexico have been shut down as the storm approaches. 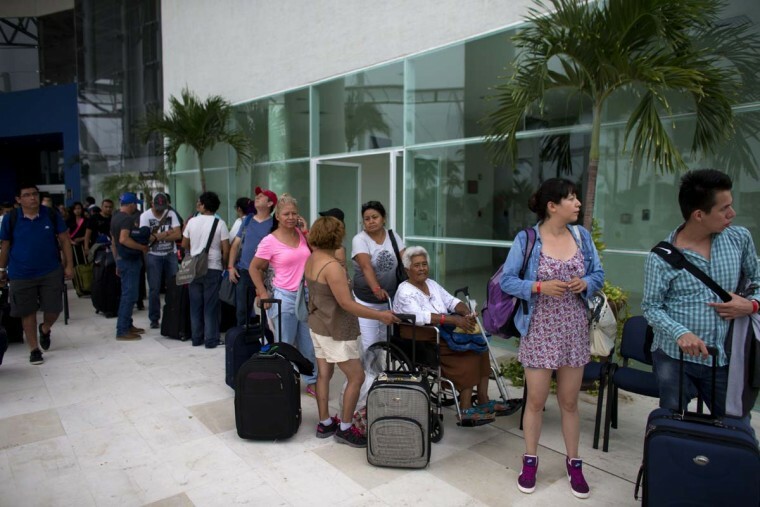 As Hurricane Patricia approaches Mexican and international tourists wait in line to board buses that will transport them to a shelter, in Puerto Vallarta, Mexico, Friday, Oct. 23, 2015. 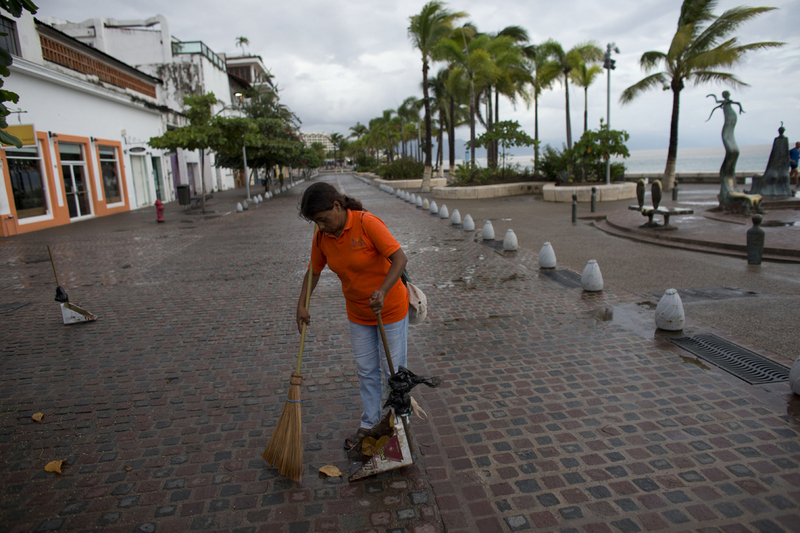 Teams of police and civil protection are walking along Puerto Vallarta’s waterfront, advising people to evacuate. 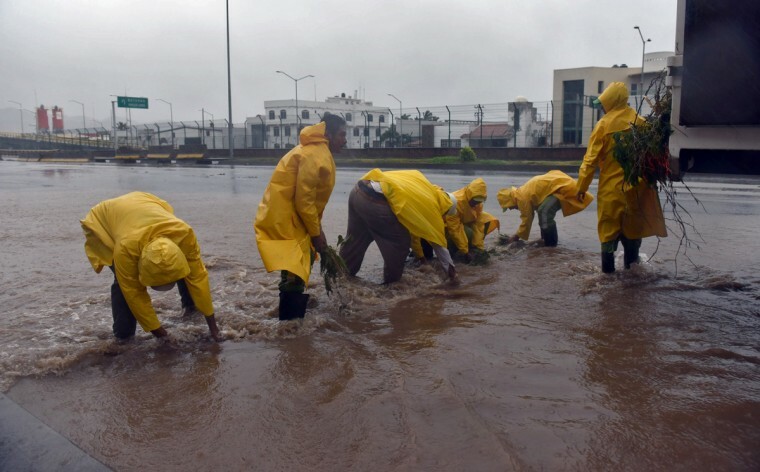 A top civil protection official says that three airports in the path of Patricia in southwestern Mexico have been shut down as the storm approaches. Framed by luggage, a toddler sits in a baby carrier as tourists wait for buses to transfer them from a conference center to a shelter ahead of Hurricane Patricia’s arrival, in Puerto Vallarta, Mexico, Friday, Oct. 23, 2015. 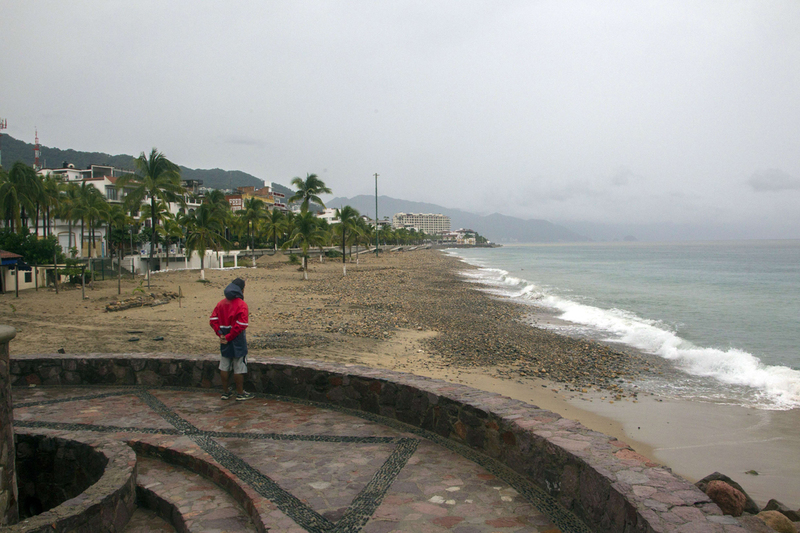 Teams of police and civil protection are walking along Puerto Vallarta’s waterfront, advising people to evacuate. 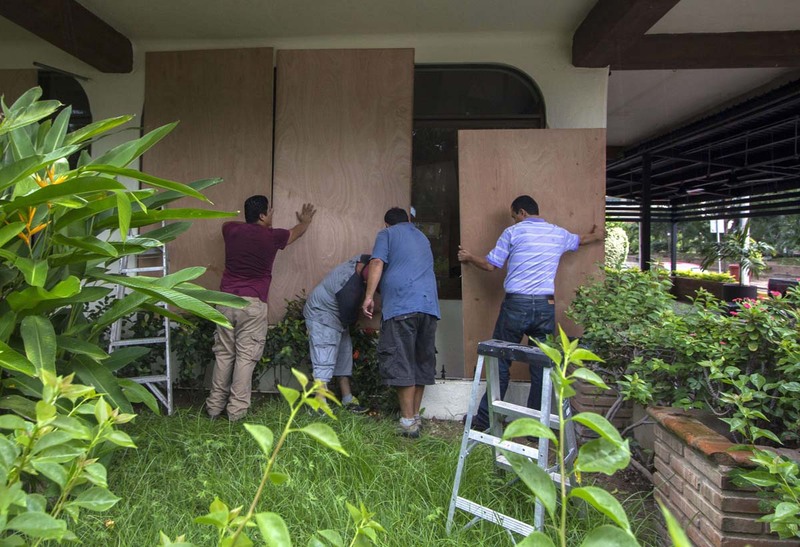 A top civil protection official says that three airports in the path of Patricia in southwestern Mexico have been shut down as the storm approaches. 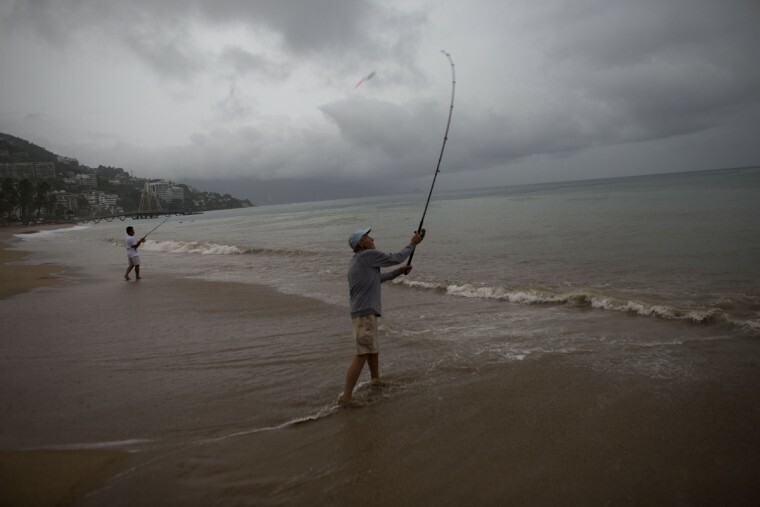 People make final preparations for the arrival of Hurricane Patricia in the Pacific resort city Puerto Vallarta, Mexico, Friday, Oct. 23, 2015. 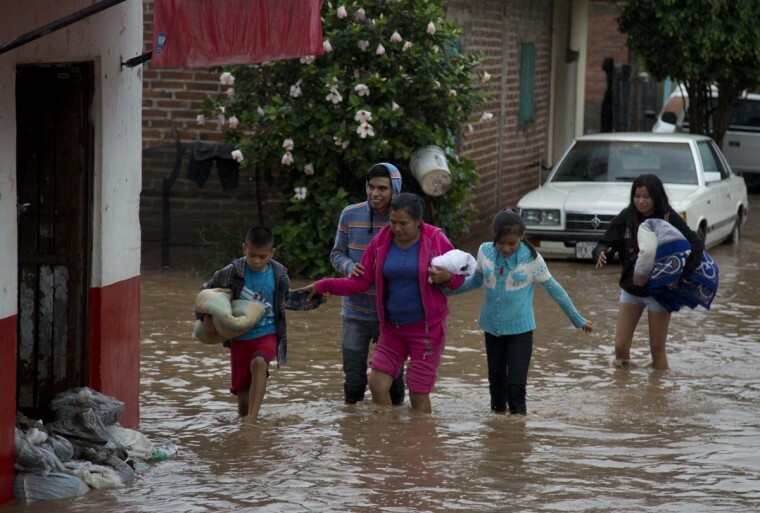 Patricia barreled toward southwestern Mexico Friday as a monster Category 5 storm, the strongest ever in the Western Hemisphere. 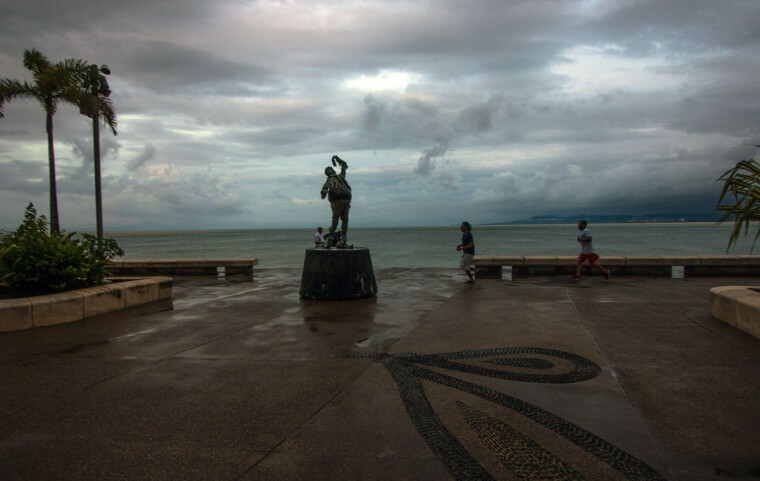 Locals and tourists were either hunkering down or trying to make last-minute escapes ahead of what forecasters called a “potentially catastrophic landfall” later in the day. 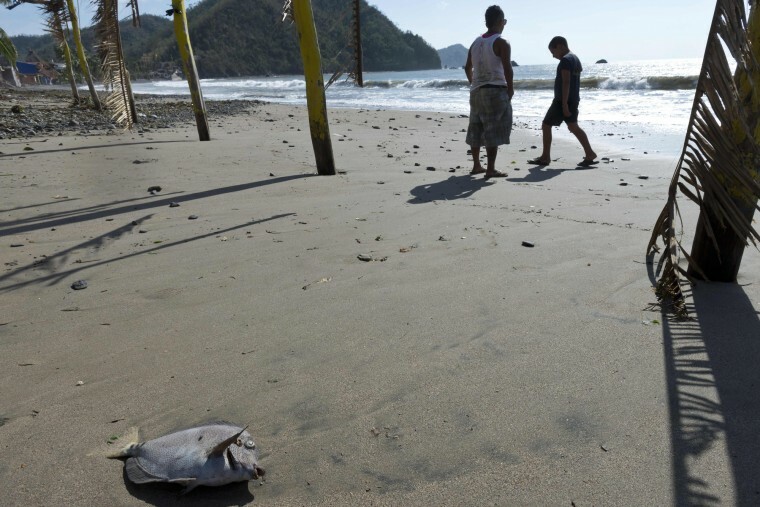 Residents prepare for the arrival of Hurricane Patricia filling sand bags to protect beachfront businesses, in Puerto Vallarta, Mexico, Friday, Oct. 23, 2015. 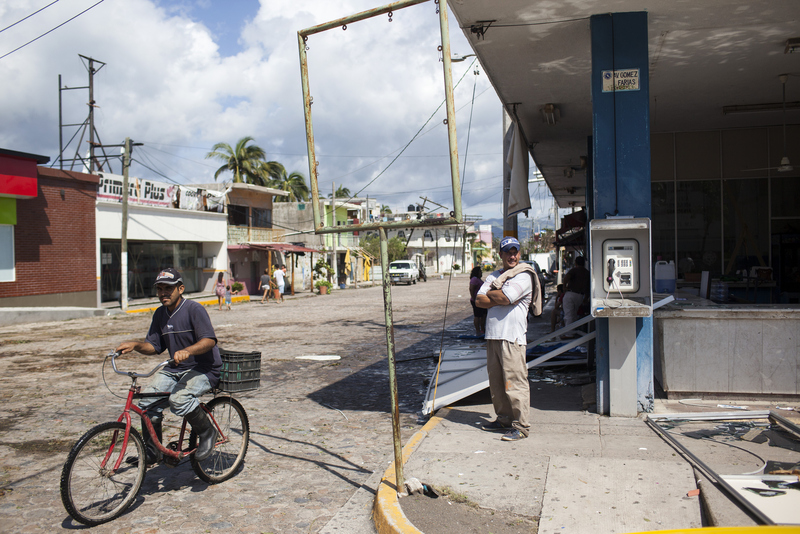 Patricia barreled toward southwestern Mexico Friday as a monster Category 5 storm, the strongest ever in the Western Hemisphere. 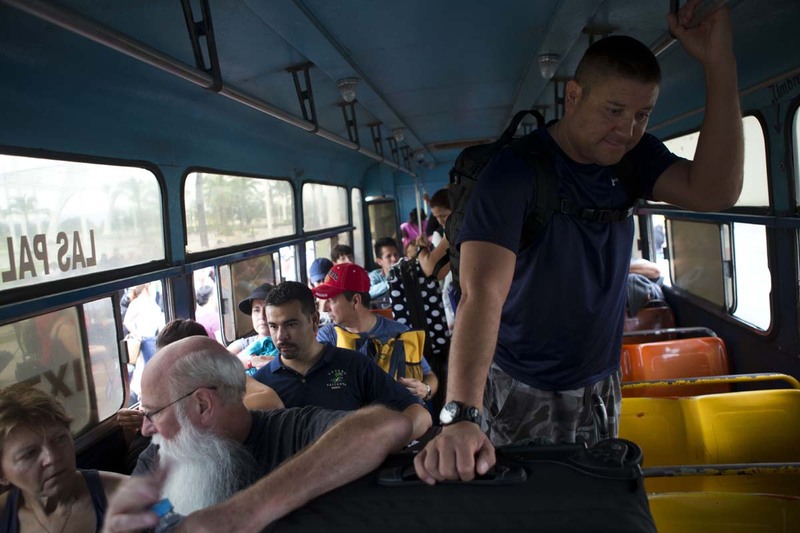 Locals and tourists were either hunkering down or trying to make last-minute escapes ahead of what forecasters called a “potentially catastrophic landfall” later in the day. 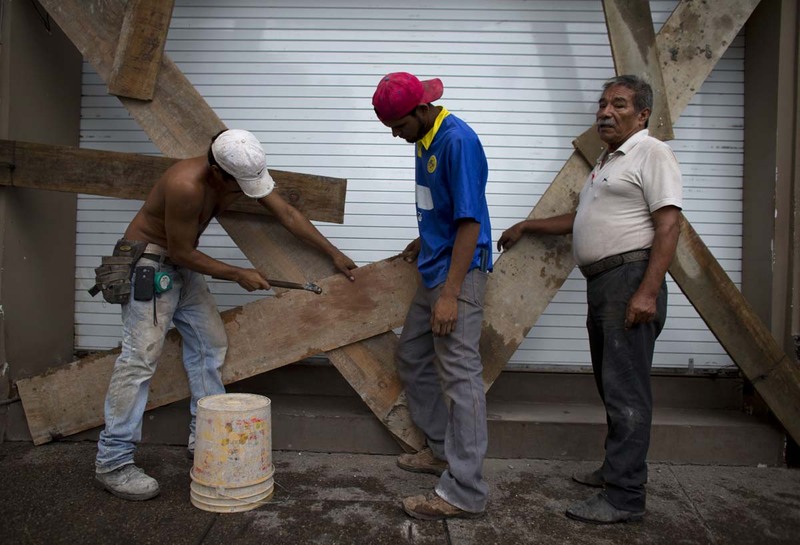 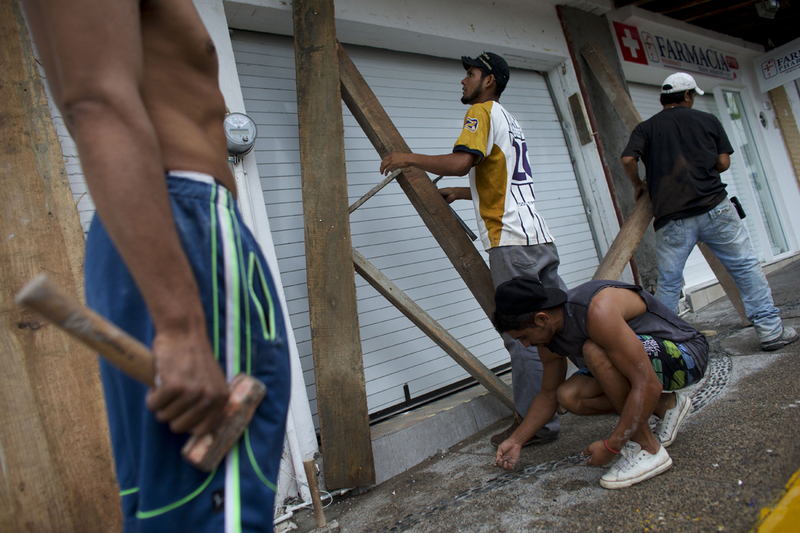 Men nail boards across the shutters of a waterfront business, as residents prepare for the arrival of Hurricane Patricia in Puerto Vallarta, Mexico, Friday, Oct. 23, 2015. Patricia barreled toward southwestern Mexico Friday as a monster Category 5 storm, the strongest ever in the Western Hemisphere. 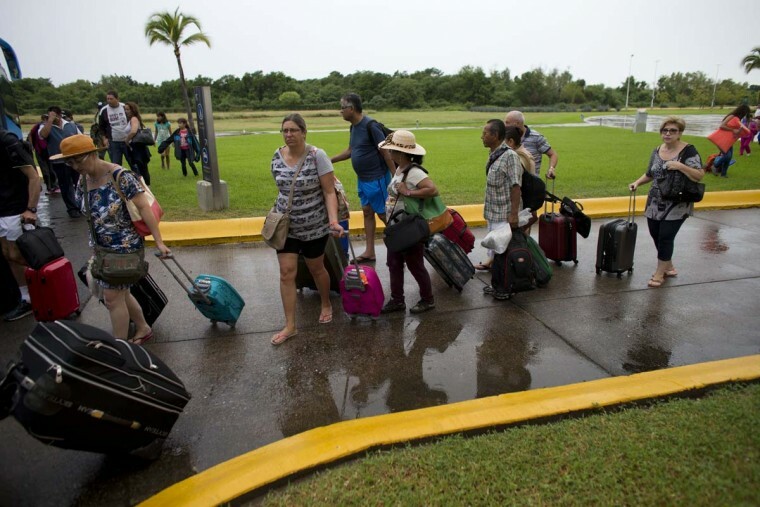 Locals and tourists were either hunkering down or trying to make last-minute escapes ahead of what forecasters called a “potentially catastrophic landfall” later in the day. 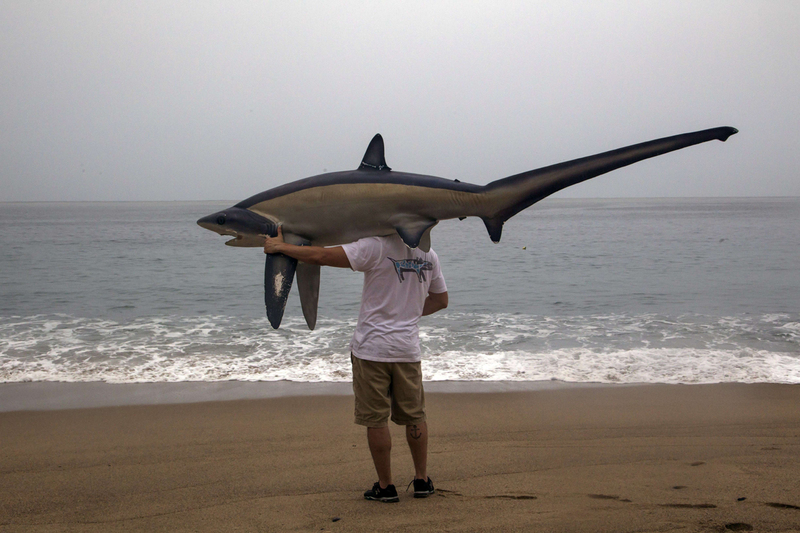 Residents visit the waterfront in Puerto Vallarta, Mexico, Friday, Oct. 23, 2015. 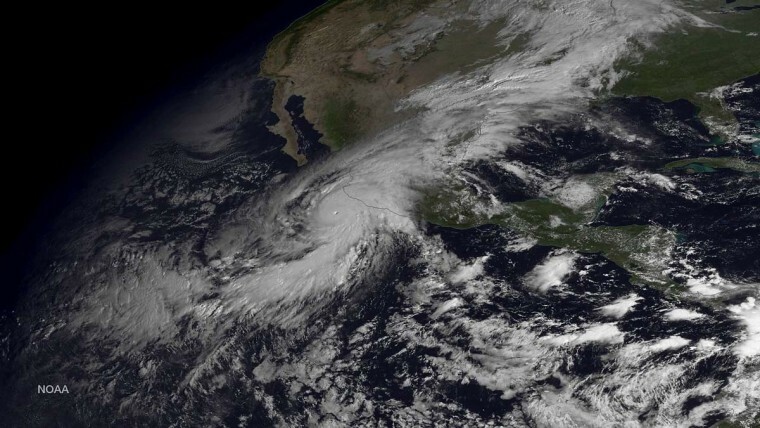 Hurricane Patricia barreled toward southwestern Mexico Friday as a monster Category 5 storm, the strongest ever in the Western Hemisphere. 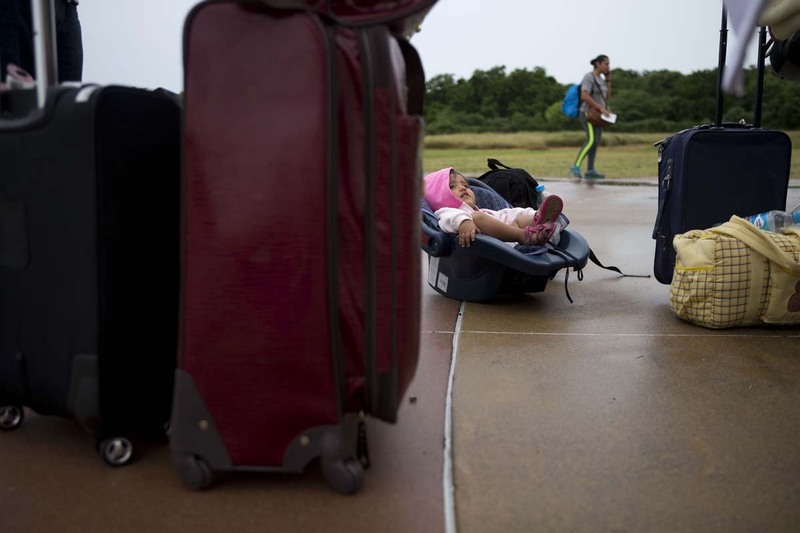 Locals and tourists were either hunkering down or trying to make last-minute escapes ahead of what forecasters called a “potentially catastrophic landfall” later in the day. 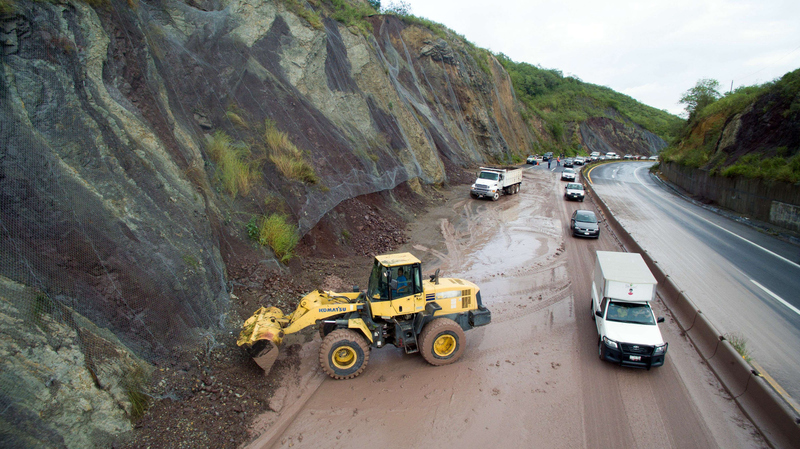 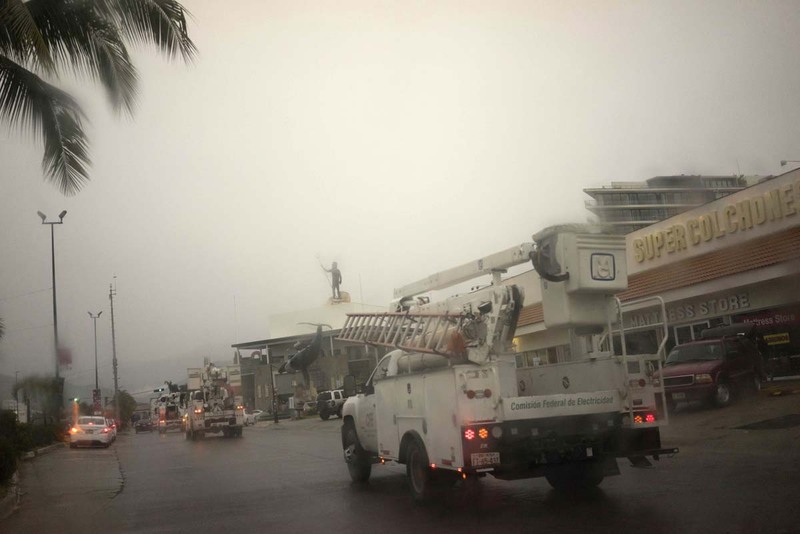 Trucks belonging to Mexico’s Federal Electricity Commission (CFE) drive down a road in the Pacific resort city Puerto Vallarta, Mexico, Friday, Oct. 23, 2015. Hurricane Patricia barreled toward southwestern Mexico Friday as a monster Category 5 storm, the strongest ever in the Western Hemisphere. Locals and tourists were either hunkering down or trying to make last-minute escapes ahead of what forecasters called a “potentially catastrophic landfall” later in the day. Light rain begins to fall on the empty tarmac of the airport in the Pacific resort city Puerto Vallarta, Mexico, Friday, Oct. 23, 2015. Hurricane Patricia barreled toward southwestern Mexico Friday as a monster Category 5 storm, the strongest ever in the Western Hemisphere. 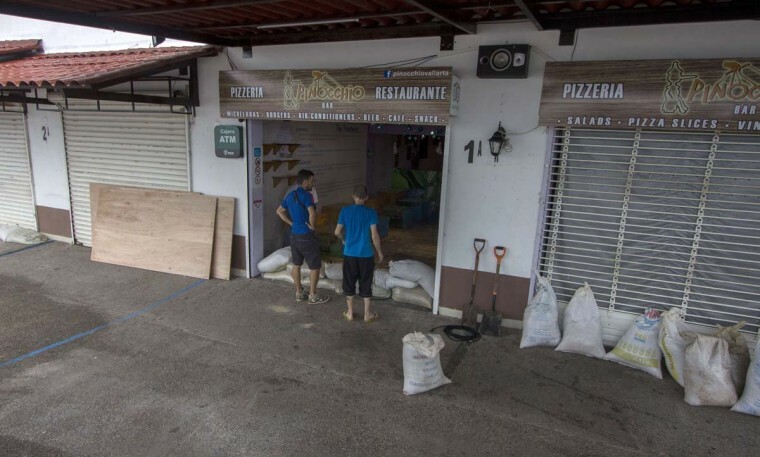 Locals and tourists were either hunkering down or trying to make last-minute escapes ahead of what forecasters called a “potentially catastrophic landfall” later in the day. 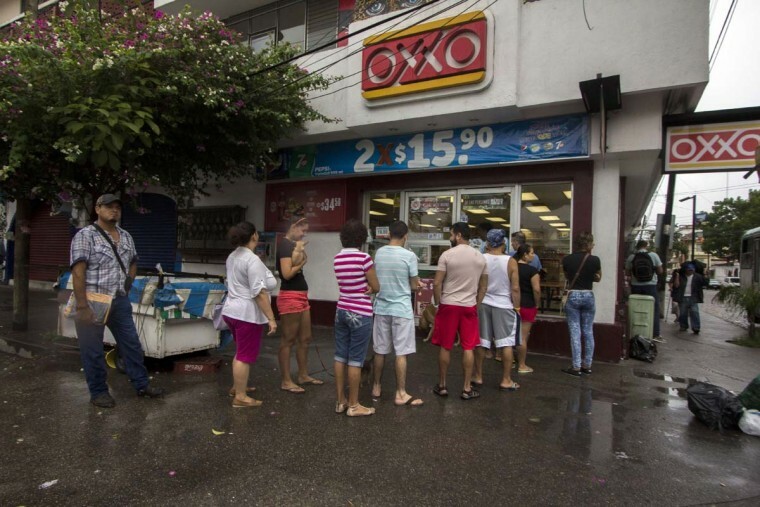 People line up to buy food and water before the arrival of hurricane Patricia in Puerto Vallarta, Mexico on October 23, 2015. 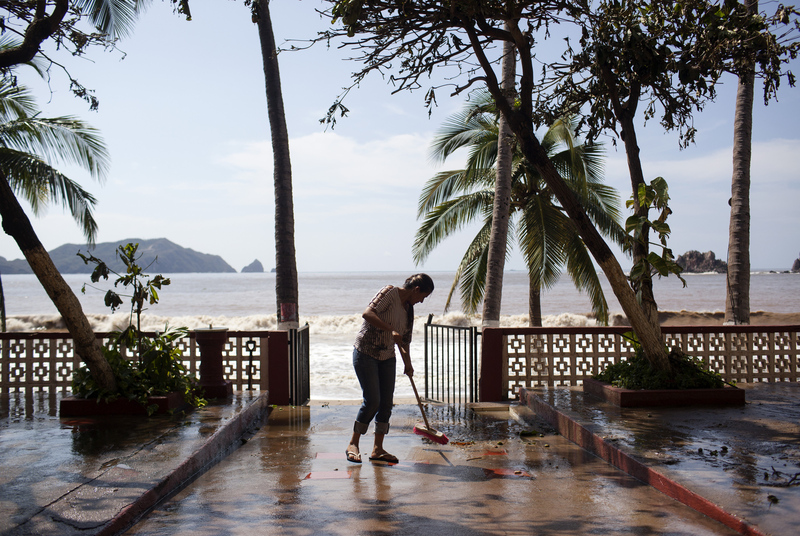 Monster Hurricane Patricia rumbled toward Mexico’s Pacific coast on Friday, growing into the strongest storm on record in the Western Hemisphere as the country braced for a potential catastrophe. 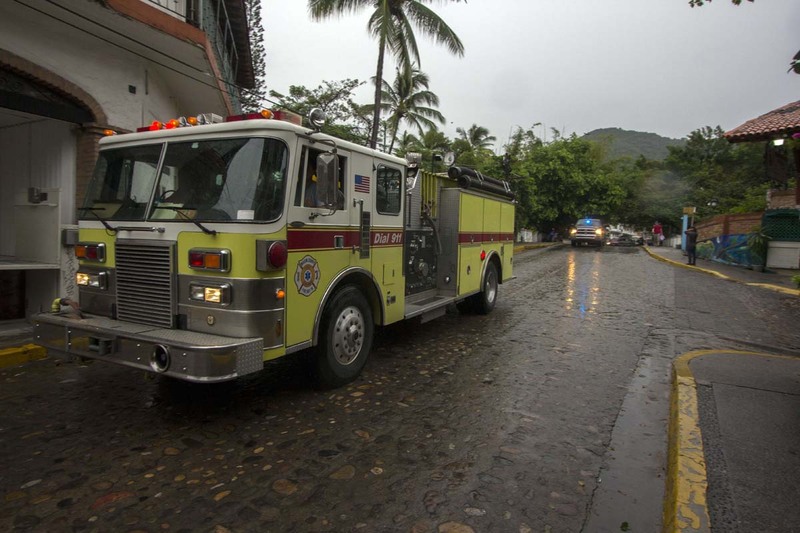 Firefighters deploy before the arrival of hurricane Patricia in Puerto Vallarta, Mexico on October 23, 2015. 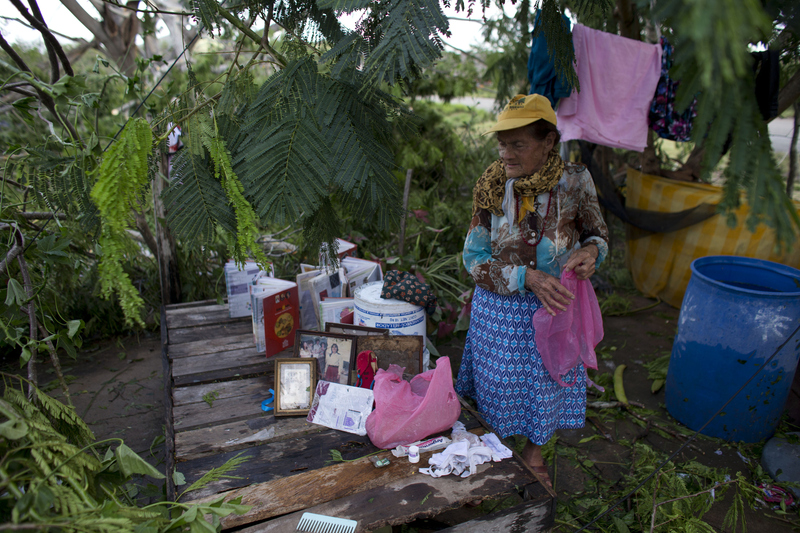 Monster Hurricane Patricia rumbled toward Mexico’s Pacific coast on Friday, growing into the strongest storm on record in the Western Hemisphere as the country braced for a potential catastrophe. 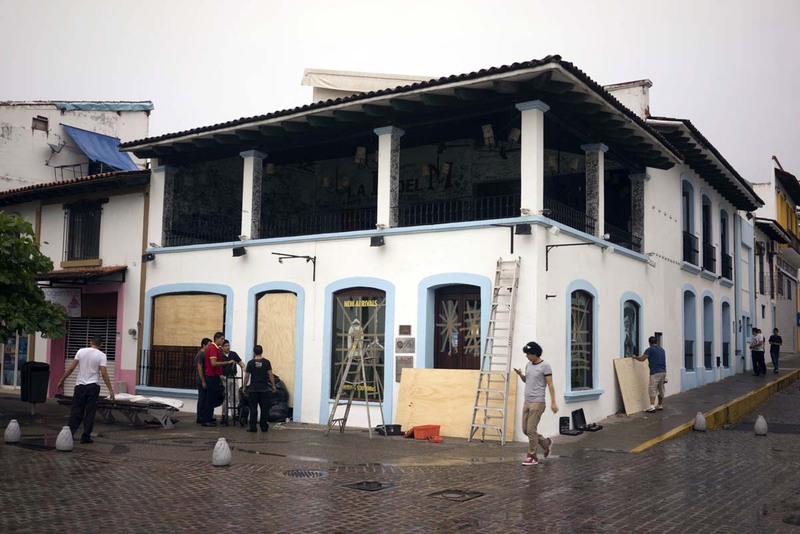 A man secures the window of a store before the arrival of hurricane Patricia in Puerto Vallarta, Mexico on October 23, 2015. 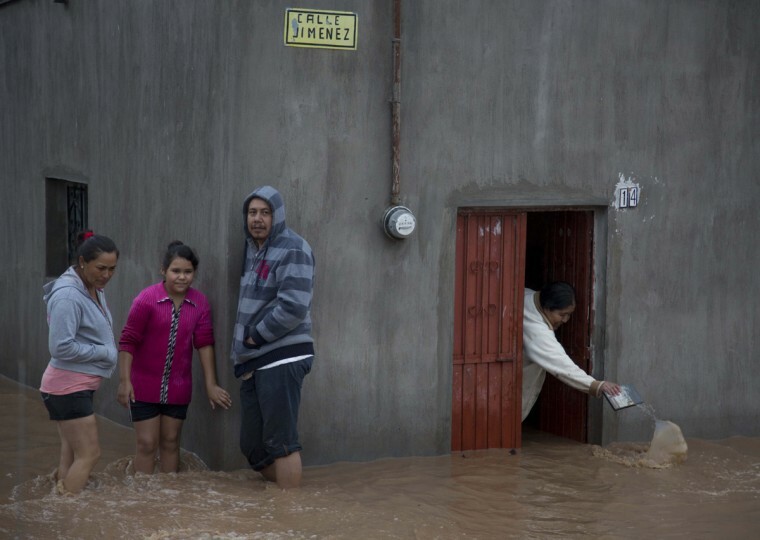 Monster Hurricane Patricia rumbled toward Mexico’s Pacific coast on Friday, growing into the strongest storm on record in the Western Hemisphere as the country braced for a potential catastrophe. 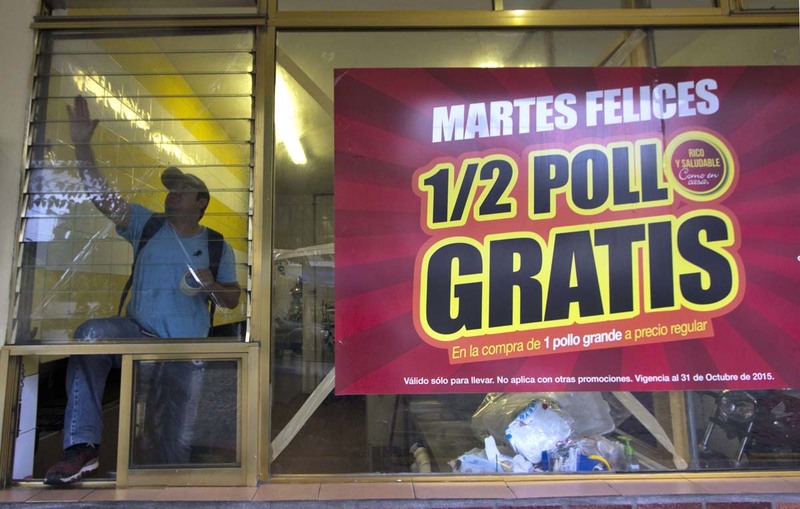 A man passes by a store with their windows blocked off in Puerto Vallarta, Mexico on October 23, 2015. 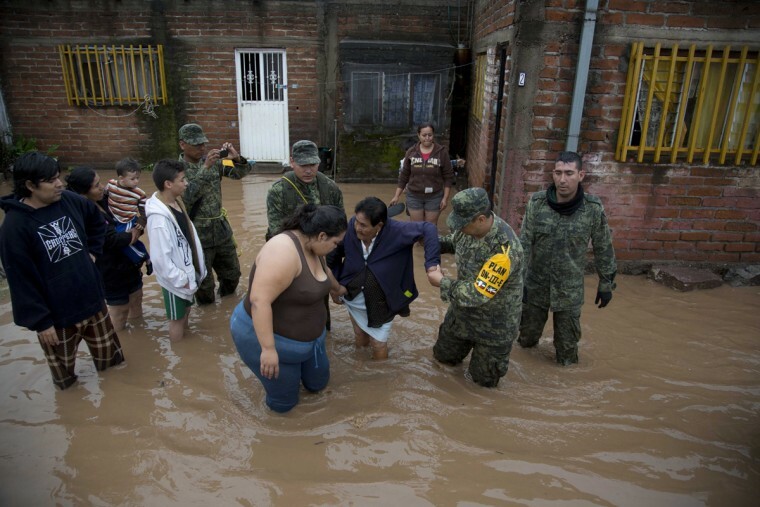 Monster Hurricane Patricia rumbled toward Mexico’s Pacific coast on Friday, growing into the strongest storm on record in the Western Hemisphere as the country braced for a potential catastrophe. 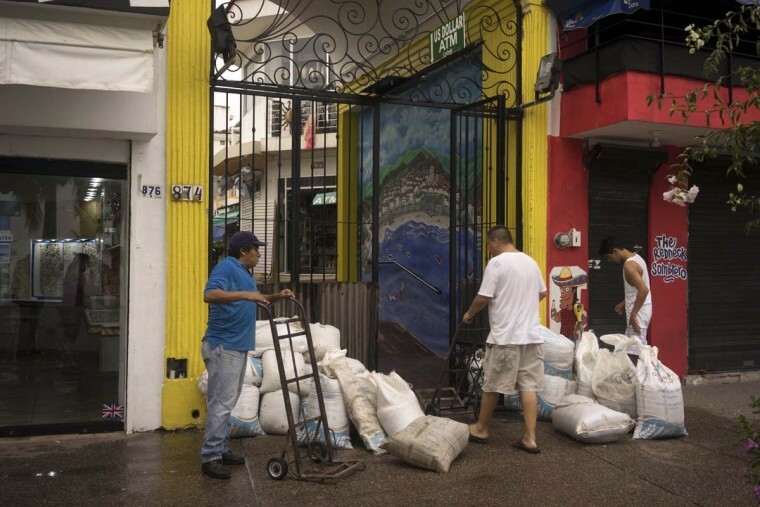 People pile up sandbags at a store before the arrival of hurricane Patricia in Puerto Vallarta, Mexico on October 23, 2015. Monster Hurricane Patricia rumbled toward Mexico’s Pacific coast on Friday, growing into the strongest storm on record in the Western Hemisphere as the country braced for a potential catastrophe. 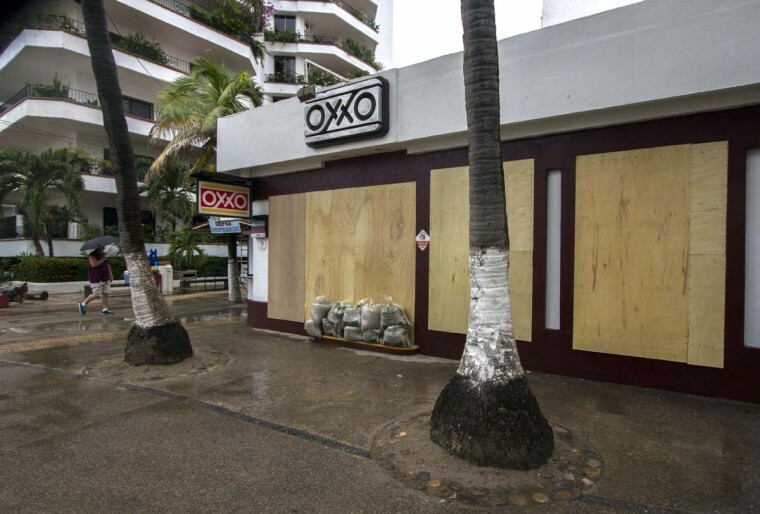 People protect store windows before the arrival of hurricane Patricia in Puerto Vallarta, Mexico on October 23, 2015. 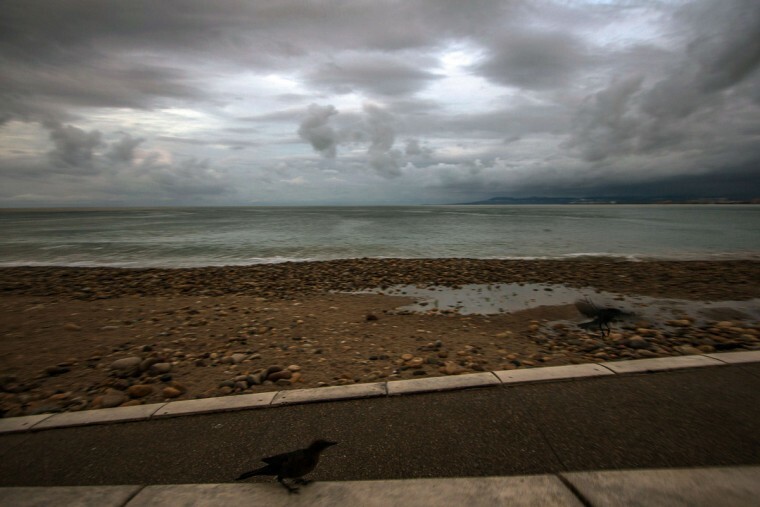 Monster Hurricane Patricia rumbled toward Mexico’s Pacific coast on Friday, growing into the strongest storm on record in the Western Hemisphere as the country braced for a potential catastrophe. Mexican and international tourists wait for buses to transport them to a shelter ahead of Hurricane Patricia, in Puerto Vallarta, Mexico, Friday, Oct. 23, 2015. 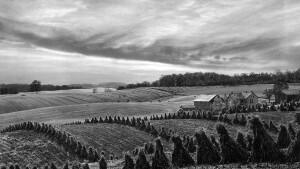 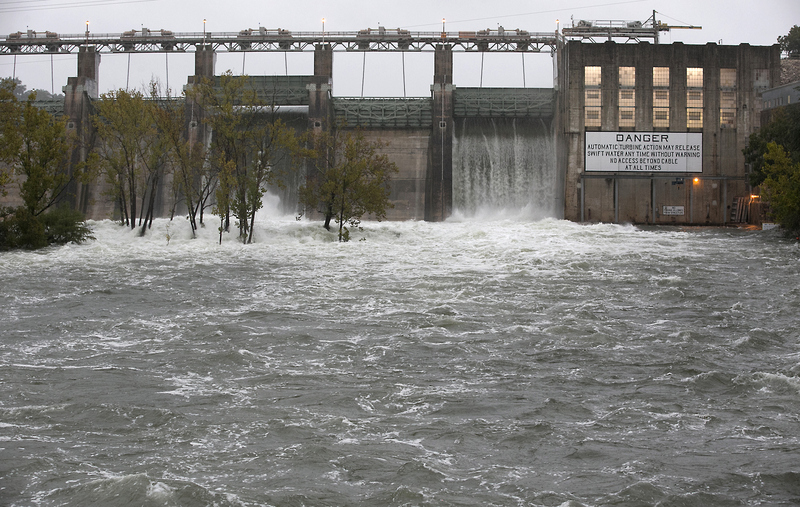 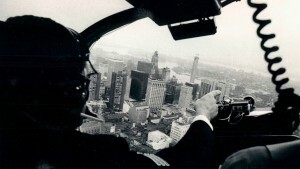 The storm is expected to make landfall later Friday.